I have polished up a new Box2D Firemonkey game demo prototype with full source code for Delphi XE5 and XE6 Firemonkey (and AppMethod). 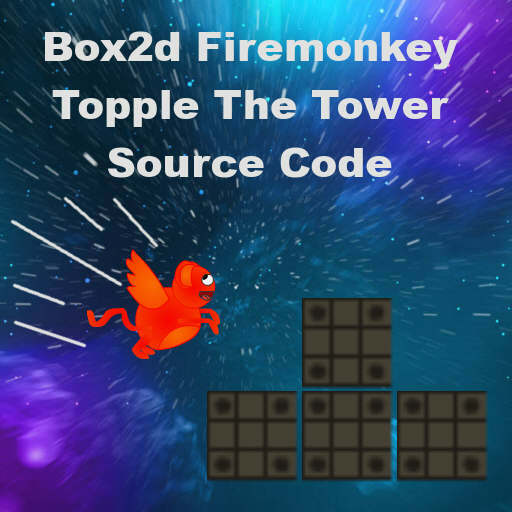 This demo is called Topple The Tower that I put together to demonstrate two different pieces of functionality that are useful for building games with the Box2D Firemonkey Physics Engine. The two pieces of functionality are attaching Delphi Firemonkey objects to Box2d bodies and detecting the strength of collisions between Box2d bodies. What this allows you to do is mirror the position of a Box2d body as a Firemonkey object like a TRectangle. I used a bit of a hack and use the OnPaint event of the TPaintBox in the project to move all of the objects like the TRectangles to keep them in sync with the Box2d bodies. You should probably use a game loop instead however. The drawing of the TPaintBox is actually turned off (change Settings.drawShapes to True if you want to see the Box2d bodies drawn). Finally, I used TFrames to create the start screen, instruction screen, and game over screen. They are set to design time visible false. This keeps them separate which makes them much easier to use. For the sound I use the Windows API but it has a TMediaPlayer for other platforms (or if you want to use each platform’s native play sound API you could). For the music I used a TMediaPlayer. The popping sound and the music are from http://www.freesfx.co.uk/. I set this project up to use Win64 as that has the best speed at handling the Box2d Firemonkey calculations but Win32 will also work fine. I built this demo for Windows and OSX desktop but it would run on Android and IOS with some changes to the layout of the project. On a tablet it would probably run fine without any layout changes.